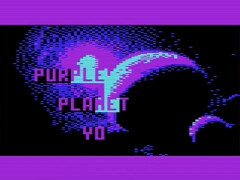 Purple Planet Yo is a new demo for the Commodore VIC20. The demo is made by Leuat and was released at the Fjälldata demo party. The demo requires a PAL/NTSC VIC20 with a 32 KB memory expansion. The Purple Planet Yo demo on YouTube.